The problem of contaminants is long time known. First problems surfaced in the early 50’s with US military pilots. Research was conducted on behalf of the USAF and early warnings were given. Nevertheless French engineers chose “bleed air systems” to provide pressurized breathing air for the Sud-Aviation SE 210 “Caravelle” which entered into service by 1959 with Scandinavian Airlines. The last of the 282 built Caravelles’ was retired in 2004. The first versions were powered by two Rolls-Royce RA-29 Avon Mk.522 jet engines, which did also for the first time in commercial aviation provide the bleed air for the cockpit and cabin. later versions were powered by Pratt & Whitney JT8D engines. 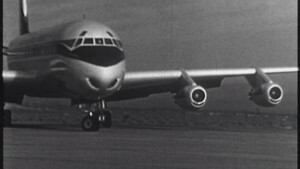 Lufthansa was among the launching customers for a bleed air version of the legendary Boeing 707, the four engine intercontinental jet, first introduced in 1958. Also these aircraft (B707-420) were powered by Rolls-Royce engines (Conway 508). Lufthansa was the first airline carrying passengers with this version in March 1960. After this all later commercial jet powered aircraft were using bleed air systems for cabin pressurization and providing breathing air.